Recent data suggests that we send more than 14 million cars to the scrap yard each year, so it’s refreshing to see some of those abandoned automobiles put to good use in sustainable, eco-friendly style. Leger Wanaselja Architecture’s fabulously ambitious McGee House does just that. The curvaceous upper walls of the 2 bedroom home are fashioned from over 100 salvaged car roofs, while the roofs of the home are constructed from sawn apart gray-colored cars. The bright and airy awning you see? It’s made entirely from the side windows of Dodge Caravans, once “America’s best-selling minivan,” now prevalent in scrap heaps. 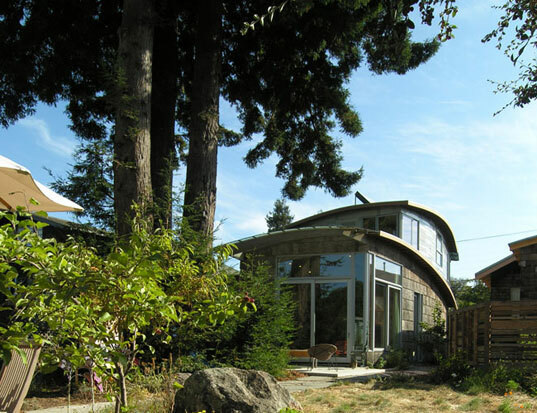 The remainder of the home’s construction is equally innovative and eco-friendly. The lower exterior walls are clad with Poplar bark, a byproduct of the furniture industry, while all the finish mill-work, from the counters to the deck rails, is crafted from salvaged wood. The wood floors are sealed with a plant resin finish for reduced toxicity. 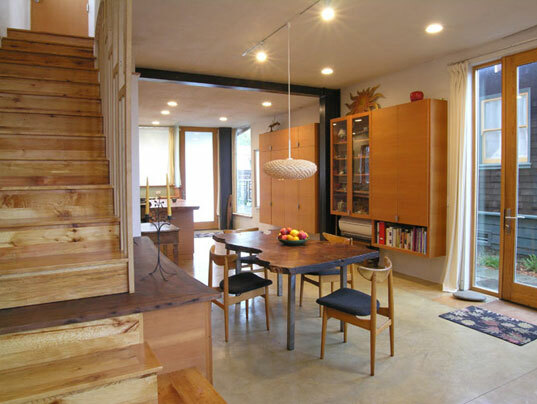 At a modest 1,140 square feet, the home is powered almost entirely by passive solar energy, with a back up system for those occasional dreary days. The cool, curved walls of the home are functional too; the house appears small and unobtrusive from the street, while the increased wall space allows additional natural light into the home’s open plan rooms. The property also includes a studio constructed from a used shipping container, which if it’s anything like their Shipping Container Home is sure to be awesome. Recent data suggests that we send more than 14 million cars to the scrap yard each year, so it’s refreshing to see some of those abandoned automobiles put to good use in sustainable, eco-friendly style. Leger Wanaselja Architecture's fabulously ambitious McGee House does just that. The curvaceous upper walls of the 2 bedroom home are fashioned from over 100 salvaged car roofs, while the roofs of the home are constructed from sawn apart gray-colored cars. The bright and airy awning you see? It's made entirely from the side windows of Dodge Caravans, once "America's best-selling minivan," now prevalent in scrap heaps.